Here’s another perfectly neat technical setup that lines up nicely with fundies. 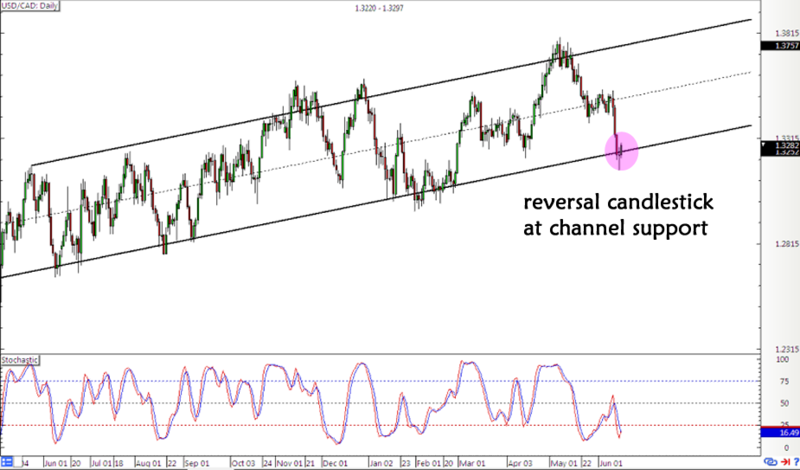 Think support at USD/CAD’s long-term rising channel could keep losses at bay? In my Comdoll Trading Kit this week, I highlighted how this pair was stalling at the mid-channel area of interest on visible on its daily time frame. However, Loonie strength allowed price to break below this near-term support and test the next floor at the very bottom of the channel near the 1.3200 major psychological mark. A doji has formed right on this level so I’m waiting for the next candlestick to close above the high to confirm the reversal signal. If bullish momentum picks up, I can aim for a good return-on-risk until the channel resistance around 1.3800-1.3900. Stochastic looks ready to pull up from the oversold area to indicate a pickup in buying pressure. In terms of fundamentals, the FOMC statement this week turned out to be dollar bullish as policymakers reaffirmed their plan to hike rates three times this year. During the presser, Yellen even mentioned that rate hikes could continue until next year. However, I’m a bit wary of the BOC’s shift to a more hawkish stance as revealed by the latest remarks from policymakers Wilkins and Poloz. Both suggested that interest rates may need to be adjusted soon, so more talks of tightening could lift the Loonie. Then again, the Canadian currency also has crude oil prices dragging it down while oversupply concerns remain in play. Earlier this week, the EIA reported a smaller than expected draw in stockpiles which led to a new leg lower for the commodity. There are still a few medium-tier reports lined up from Uncle Sam before this trading week comes to a close, but I’m inclined to think that traders might shrug off downbeat results now that Fed officials have maintained that the recent misses are just transitory. Long USD/CAD at market (1.3270), stop loss at 1.3125, profit target at 1.3775 for around 3.5-to-1 R:R.
I’ve risked 0.25% of my account on this nibbler position and I plan on adding another 0.25% if bullish momentum picks up past the 1.3300 handle. What do you guys think of this USD/CAD trend play? I had to cut losses on this one quick, as price already broke below the long-term floor. Good thing I only risked a tiny bit!